I have a face for radio, and a voice for print media, so blogging is the perfect venue for me. Orthodontics really doesn’t fit into that picture. So, when Mama Kat posted an invitation to a social media conference at an orthodontist’s office, I was intrigued, but a bit skeptical. Why was an orthodontist hosting a social media event? Also, is this something I want to get myself into? Kat would be there, and I trust her judgment (or at least if it turned out to be lame, she’d be an entertaining companion with whom to endure lame), and it was just exactly in my price range: free. Also motivating, I would get to talk to grownups; as a SAHM blogger, that is a rare and precious occurrence. Other mom bloggers to talk to? I’m in. So I sequestered my paralyzing fear of dentists into a small dark corner in the pit of my stomach, and braved up. After all, it wasn’t like I was going in for treatment, right? I was still curious about what social media had to do with orthodontics, and I have to admit, there was a part of me that was picturing the requirement to sit through a time-share sales pitch before getting to go one the 2 hour booze cruise. As it turns out, there were no time-shares, and no booze. This all played out before noon on a Saturday morning. I walked in, said hi, and they took me back to take an impression for my teeth whitening tray. Wait, what? The little ball of fear in my tummy churned a bit. But it was just an impression… quick and easy. No drills, needles, or reprimands about flossing, and the need for more frequent dental visits. I had forgotten that the swag for this little gathering included a custom fit teeth-whitening kit. Awesome! So what was this all about? What was the orthodontics angle? It turns out that Dr. Molen is quite the savvy orthodontist. He recognizes the power of social media and mom bloggers, and also made the connection that most of his patients have moms or are moms. So if he provided a space for mom bloggers to come together and talk about blogging, maybe they would blog about their experience in his office… Hey, look what just happened here. Kat put together a great presentation on blogging basics that covered everything from “should you start a blog?” to finding your niche (which I still haven’t done) to monetizing your blog. The discussion came at a timely point for me, because I’ve been putting a lot of thought into how I’m making money from blogging. 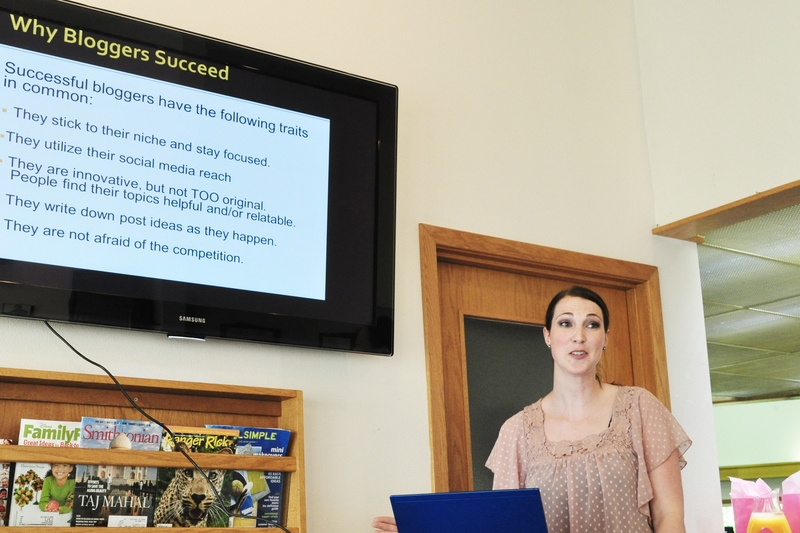 Thanks to her presentation, I think the best choice for me personally is to use my blog as a showcase for my writing, a portfolio of sorts, to generate paid writing opportunities elsewhere, rather than focusing on paid product reviews and advertising. Perhaps I should start proof-reading and using spellcheck as well? 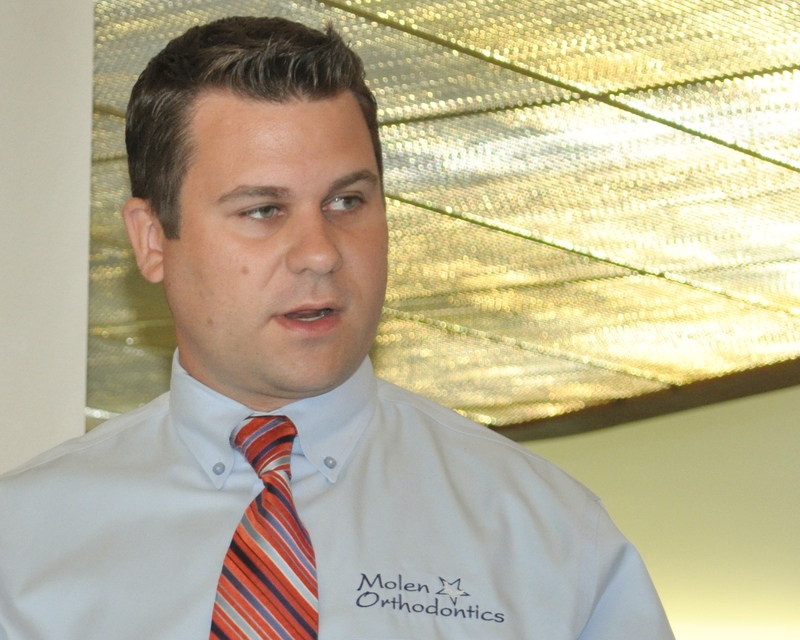 After Kat finished up, Dr. Molen stepped up and took a few moments to dispel some myths about orthodontics. I have to admit that I was holding on to some incorrect ideas about what orthodontics entails. I really thought it was only about straight teeth, I had no idea of the artistry involved, or the impact on the entire face. I also came away with some specific red flags to keep in mind in case my daughter ever needs orthodontics. I know now to turn and run if any orthodontist wants to fit her with headgear like I wore through 5th and 6th grades. Are you laughing at that poor 11 year old in the picture? It’s all right, Internets, I embrace my inner awkward. By far, the best part of the entire experience was the time we had to sit around and chat. There were, I believe, six of us bloggers in attendance, so it was a small enough group to really have a nice chat. I would have enjoyed more time chatting. I would have enjoyed more time chatting so much that I wonder if other Seattle bloggers would enjoy time chatting in the real world. What do you think? Is anyone else interested in meeting up in a coffee shop for some “Coffee Talk”? (Admit it, you said that in a Linda Richmond/Mike Meyers voice.) No agenda, no presentations, no entrance fee… just bloggers meeting up somewhere in the Seattle area to get a cup of coffee or glass of wine and talk blogs, SEO, parenting, privacy, trolls, and anything else that happens to be on our minds. Is there enough interest to set up a Meetup? What do you think? 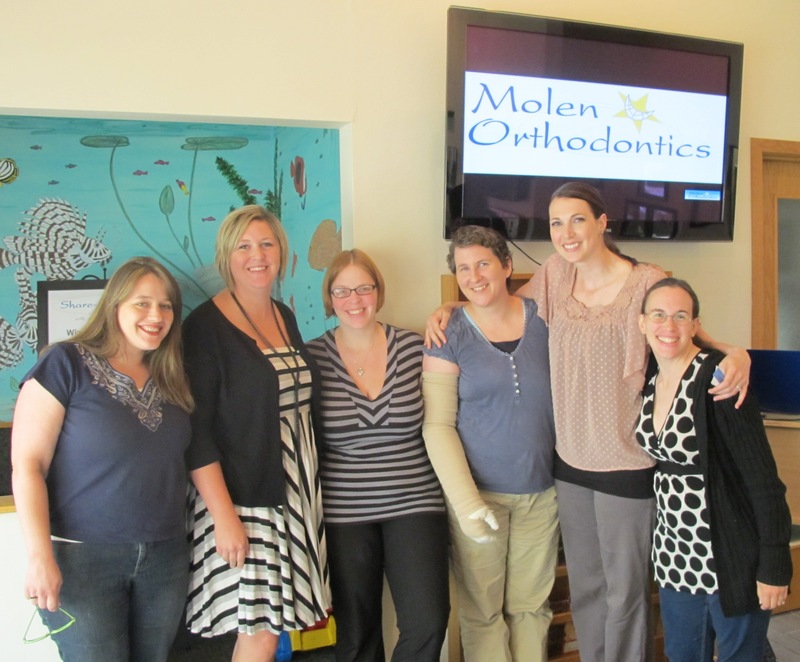 I want to send out a big thank you to Dr. Aaron Molen at Molen Orthodontics. Thank you for thinking of us, coming up with a completely original idea, and making it happen. I’d love to see more of this. And to the other ladies in attendance, @youcanstayhome, @improperlykeli, and @BitingMyHand, it was so lovely to meet you!